K.R. Mangalam World School, G.K-II successfully organised its maiden student exchange programme with Ozanam Epil Campus, Lille, France, from 14 October, 2018 to 27 October, 2018. A delegation of twelve students along with three teachers visited the school and were hosted by their Indian counterparts. 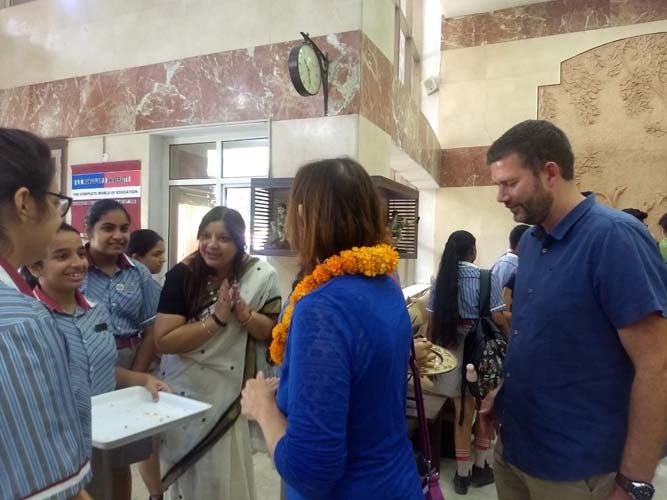 The two-week visit not only exposed the students to the Indian education system but it also gave them an insight into the Indian culture and customs. The students attended classes with an eclectic mix of co-curricular classes like drama, arts, yoga, sports and music. The students were introduced to hands-on and interactive way of learning which helped in the better understanding of the subjects. Living within a homely setup, the French students experienced the Indian way of living and their culture. 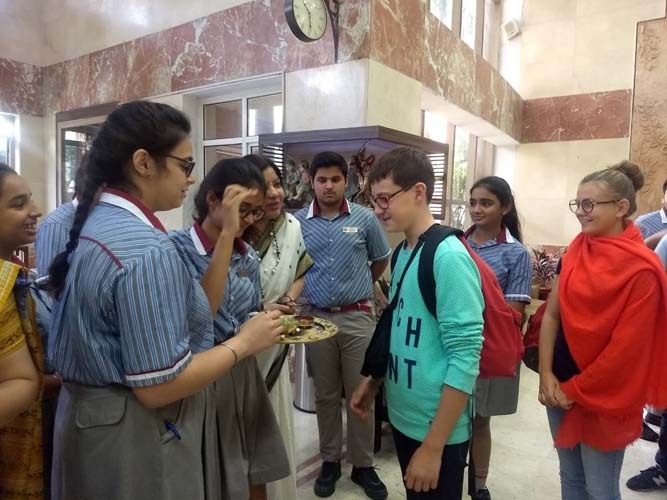 The school went an extra mile to make their visit a memorable one by conducting myriad activities along with educational visits to places of significance in New Delhi, Jaipur and Agra. The students were familiarized to the diverse religions practiced in India whose essence is one, as they visited the Iskon Temple, Akshardham Temple, Laxmi Narayan Mandir, Bangla Sahib and the Roman Catholic Church. The beholders of the antique and new, the traditional and modern- The National Museum and the National Museum of Craft and Handloom, offered the visiting guests a storehouse of the past history of India and its art heritage. 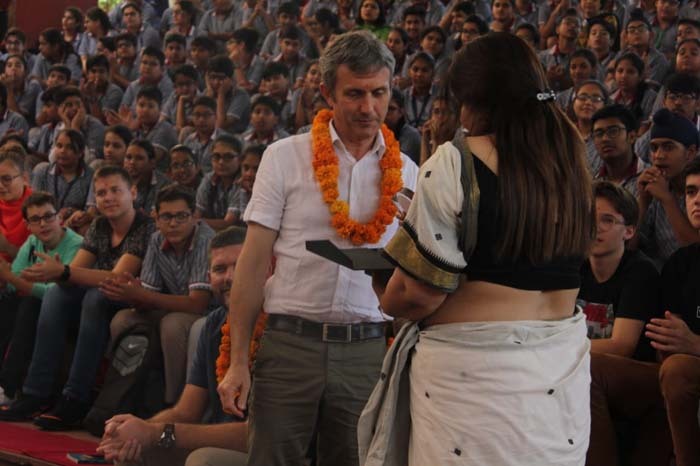 The visit to Dilli Haat was a treat for the French students as it was an amalgamation of creativity at its best with a varied display of art, music, food and colours from all corners of India. It was indeed a touching moment to see the visitors relish the Indian cuisine. Visiting the pink city, Jaipur, was a fun filled experience as they were introduced to the rich cultural heritage of the country. The French students thoroughly appreciated the beauty of the Amber Fort and Birla Mandir. A day at the Taj Mahal, the much-awaited destination was exciting and educative for the French students. It was indeed a pleasure for them to watch the World heritage as it sparkled and showed off its grandeur. The French delegates were deeply touched by the hospitality of the Indian hosts. The cultural exchange programme culminated with the farewell given by their Indian counter parts. The principal, Dr Sangeeta Arora, presented the students with gifts and mementos. She expressed her appreciation on their acceptance of the Indian ways of living and hoped that the Indian counterparts exchange would be fruitful and enriching too. The exchange program was a grand success as the students returned home with a sense of accomplishment and satisfaction at having been exposed to such a plethora of new ideas and experiences.